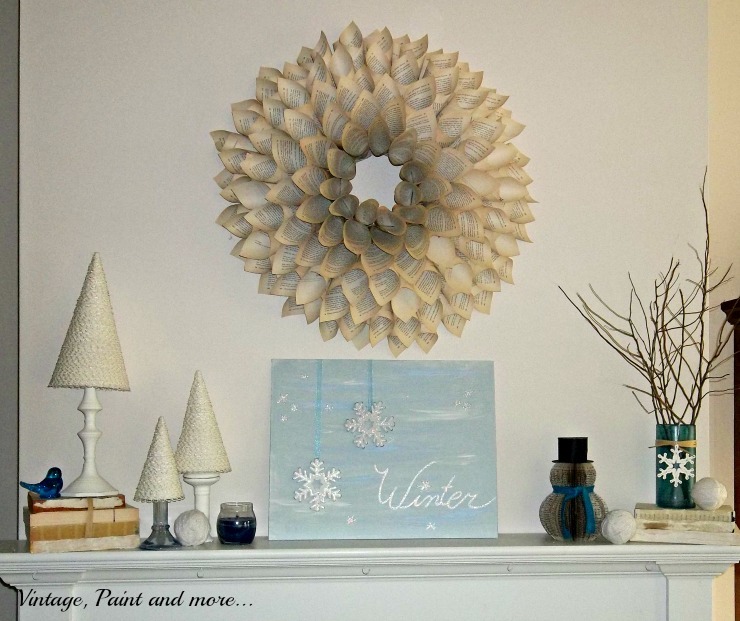 I thought I would show you our winter mantel. and unable to bring it to you before now. 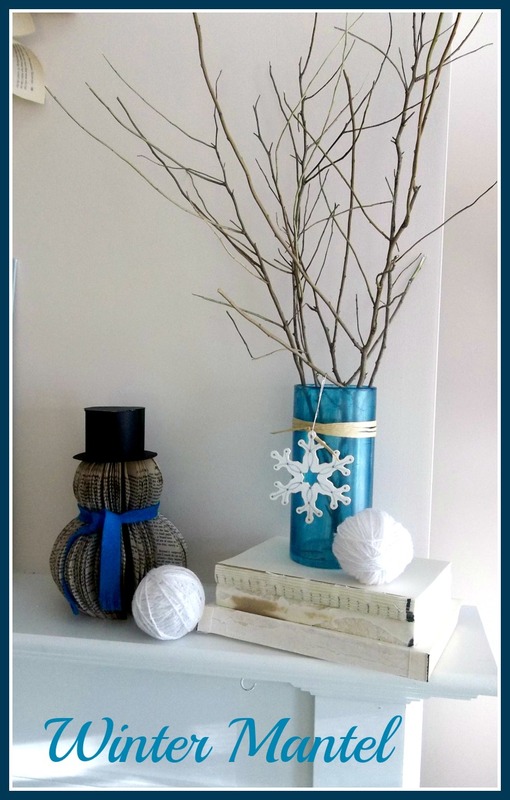 As you can see blue and white prevailed for my wintry decor. Of course it doesn't hurt that blue is my favorite color either. Every thing is either thrifted, handmade or I already had it. Nothing was purchased for this little bit of prettiness. The trees I made for our Christmas center piece for the dining room table. ( You can find that post here ) They are all sitting on thrifted candlesticks. The stack of books are thrifted books I tore the covers off of and tied with raffia. The little blue bird - a favorite piece of my Mother's. The candle came from Dollar Tree. And the snow ball is a Styrofoam ball ( 3 for a dollar at Dollar Tree) that has been wrapped with white yarn. 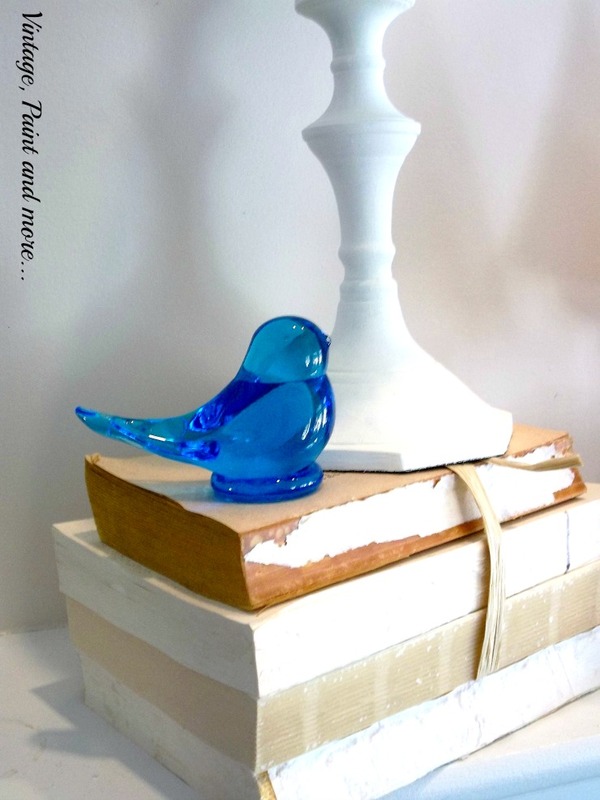 I love this little blue bird - he makes me smile every time I look at him. And that would be several times a day. On the other side is another stack of thrifted books and two more snowballs. 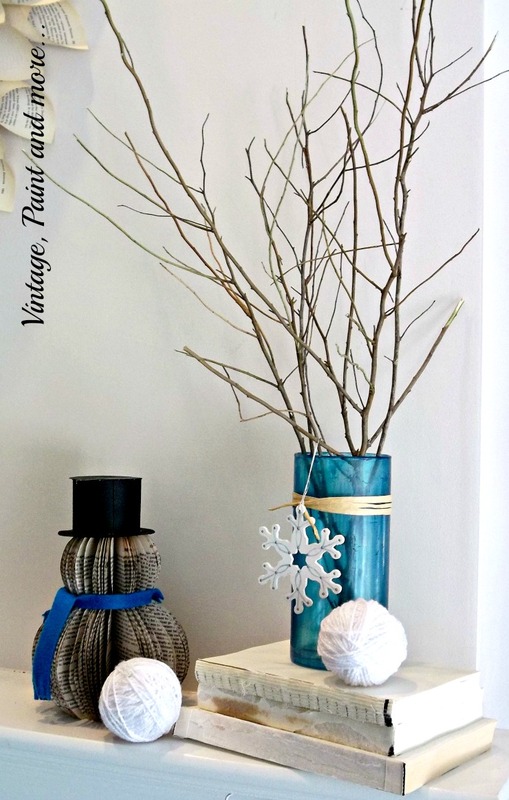 The blue vase is a Dollar Tree find that I painted with glue and food coloring - I wrote a post about that project here. I tied raffia around it and filled it with sticks from the yard. Then I hung a snowflake ornament on it. 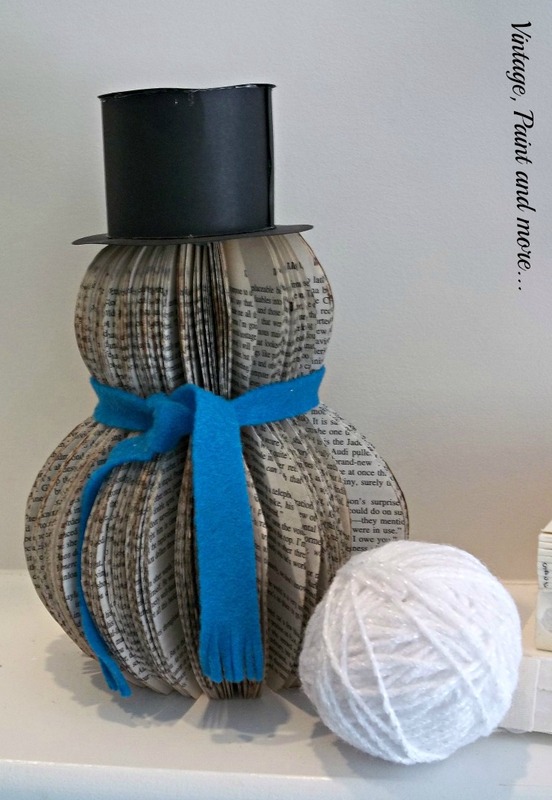 The snowman is made from a thrifted paperback book. I love making these book page art crafts. But then I love anything with script on it. 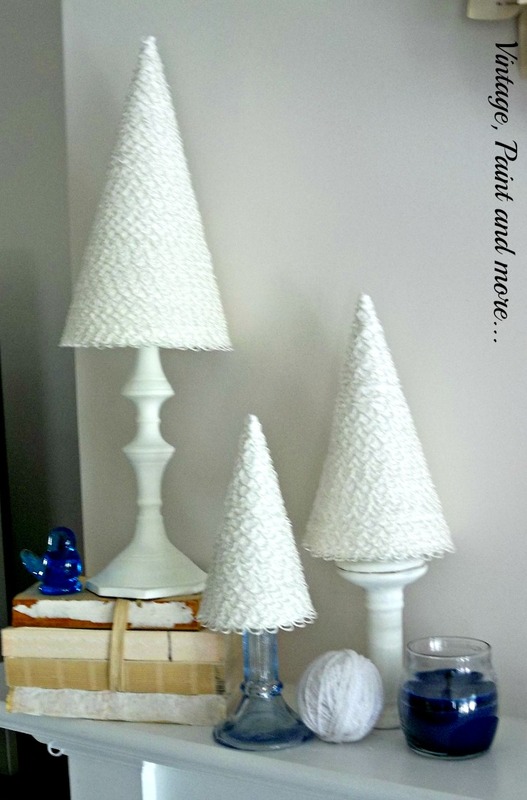 These are so simple to make just like the pillars and pumpkins that are all over blog land and I have a tutorial here you just have to draw a half snowman shape and place it in the crack of the book, trace the shape and cut out. Then proceed as the tutorial explains. Then I added a blue fleece scarf - just a 1" x 12" length and cut small fringe at each end. I made the top hat out of black card stock - two circles - one larger than the other and a strip that is taped to make a cylinder. Add the circles on either end of the cylinder and you have a hat. The picture I painted. It's a flat canvas from Michael's that I painted with leftover paints and craft paints I already had. 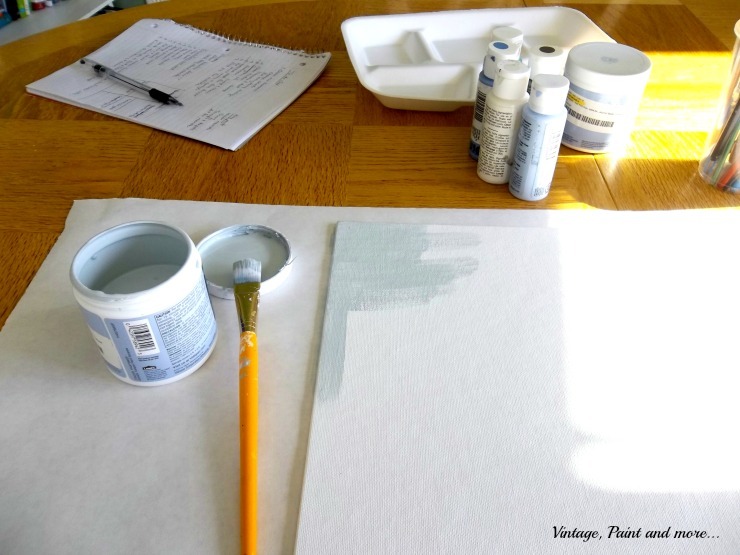 The base color is a sample pot of Valspar's Nordic Blue that my neighbor gave me. I then used blues, white, and grey dry brushed over it to mimic a winter sky. Took all of maybe 10 minutes. When it was dry I wrote the word winter on with a Sharpie white paint pen. I first wrote the word on a piece of scrap paper the way I wanted it to appear. Then I covered the back of the paper completely with chalkboard chalk. ( I read this tip on Pinterest - didn't pin it ) Then I traced the word onto the canvas. It leaves a faint line that can be written over with the paint pens. When the paint dried I went over that with a glitter glue. The two snowflakes are a couple of ornaments that I never used. I just outlined them with glitter glue. 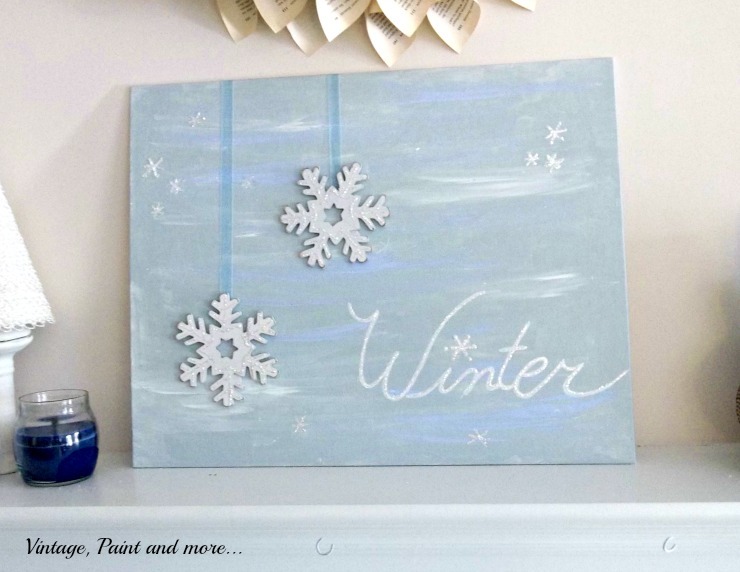 I glued two lengths of sheer blue ribbon on the canvas with hot glue and then glued the snow flakes on. I then added a few little freehand snowflakes here and there. And I have my winter art. 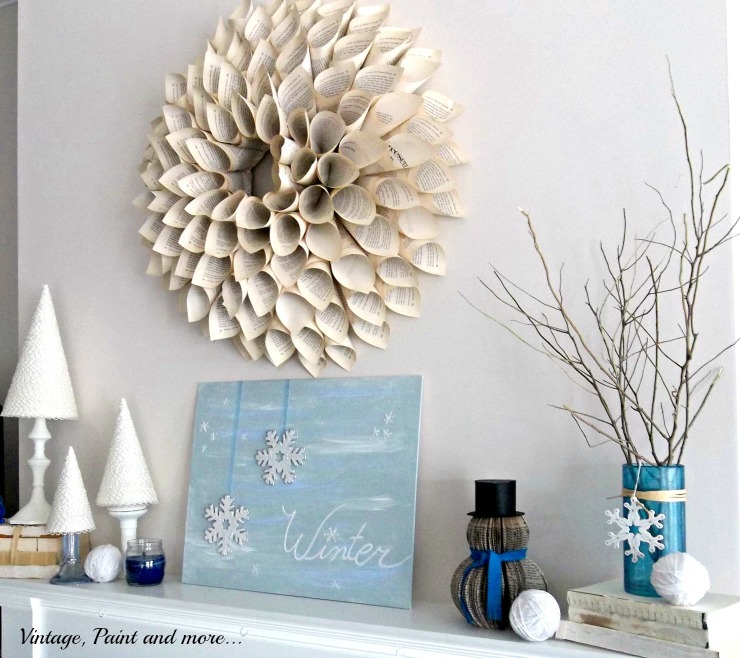 I really love this mantel it reminds of snow and the winters we used to have. Living here at the beach we rarely get snow and the temps are usually fairly temperate. I'm not complaining - that's why we moved here - to get away from that stuff. But as long as I don't have to mess with it I'm okay. I just love to look at it. This mantel will probably remain for a few more days and then if I get real motivated I may do a Valentine mantel. I am working on other things right now and Valentine's is on the back burner. We just don't do too much for Valentine's Day. did you just move right on to Valentine's? 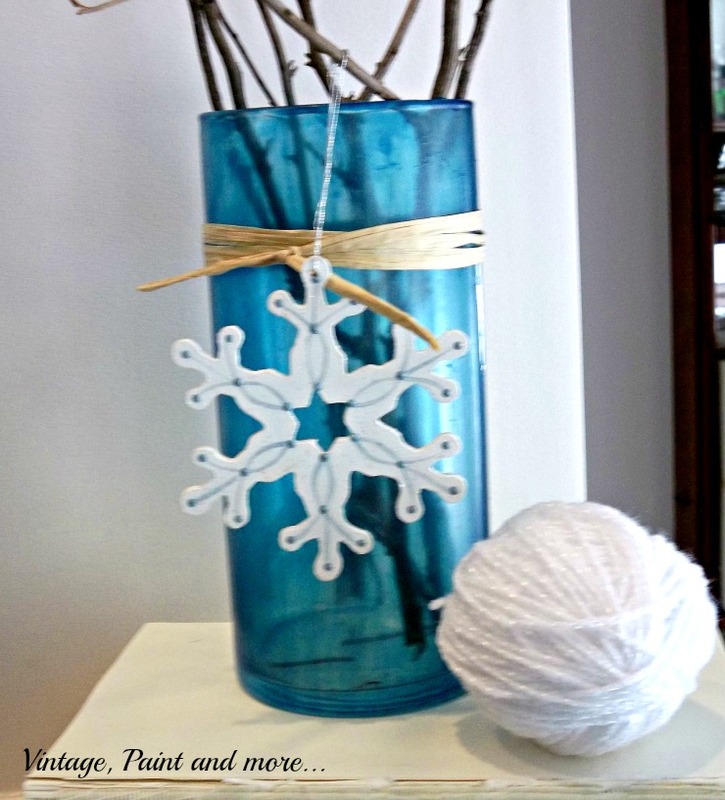 Thanks Daniella, the vase and the snowman were actually crafts I did with my grandchildren. They love doing stuff like that and I love crafting with them. Thanks for stopping by. Your mantle is lovely. I love the trees and your painted picture the best. Love the wreathe too!! I would have never thought to tear the jackets off a book but I love how you tied them together. Very clever!! What beach do you live at? It looks beautiful Cathy - I love that little bird - but wow - I'm so in love with those wreaths -most definitely have to make me one of them!!! Very pretty! The bird is definitely smile invoking! Your wreath is gorgeous, I've never made one, I really should, I think.